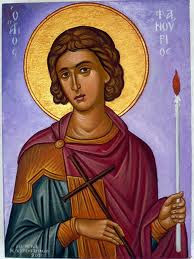 On Aug 27th, according to the Greek Synaxarion, we remember the Holy Martyr Phanourios. He appeared to people on the island of Rhodes in 1500. Several people had a vision of the saint and then his icon was discovered. The icon depicted a young soldier holding a sword in one hand and a lit candle in the other. There is a tradition concerning him and his mother, who was a harlot and great sinner. His love for his mother caused him to pray for her incessantly. 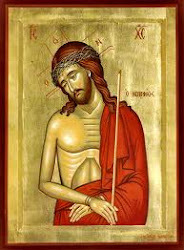 At the time of his martyric death by stoning, he could not even then forget his mother, and with the boldness that is peculiar to athletes of Christ, prayed: "For the sake of these my sufferings, Lord, help all those who will pray to Thee for the salvation of Phanourios' sinful mother". Many to this day pray for his mother, and have her listed in their personal diptychs used for commemorations in the Divine Liturgy as "The Mother of St Phanourios" since her name is not known. On the day of the Saint, there is a tradition that the faithful bake a special bread, and according to some accounts, give it to the poor as alms in the name of his mother, and others, share it with at least seven other people. St Phanourios' name gives a hint about another tradition concerinign the Saint. "Phanourios" comes from the Greek word, "phanerono", meaning "I reveal". He is know to help people find lost things. Some have therefore also referred to him as "Saint lost and found"! This is not just an idle story repeated without basis, as the editor of this piece has experienced incidents himself, and know many people who have also been helped by St Phanourios to find lost items. After the lost item is found, one should bake a Phanouropita, (basically a loaf of sweet bread) in memory of St. Phanourios' mother, and give to the poor, as above. If the bread is first brought to church to be blessed, A Litya blessing service with a prayer specially composed for the Saint may be used. The following recipes are supplied by the kindness of Matushka Anna Lardas, who posted them to a mailing list some time ago. The fasting bread (with oil for those days that a a little less strict) actually tastes very good, and whose preparation makes an excellent father-daughter "special time" that the whole family benefits from. In other words, the recipe is quite easy and forgiving, and kitchens can always be cleaned. Αναρτήθηκε από amphilochios στις 5:25 μ.μ.